During the time frame of the project six regions in four countries (Germany, Ireland, Italy and Spain) will implement legislative and organisational measures for promoting high-RES DHC, also benefitting from the know-how transfer by the two Danish partner, bringing in the success story from Denmark. In order to assure a correct implementation of these measures there will be set up a regional task force on high-RES DHC in each participating region and an ambitious capacity building activity will be carried out, aiming at involving the key stakeholders in the regions and also at national level in the participating countries. Key stakeholders are technical staff and city planners from municipalities in the region, other regional and local authorities in the country, technical and managing staff from DHC utilities, DHC industry, technical designers, cooperative unions, consumer protection associations and the financial sector. All stakeholders will be trained on the most adequate topics through working seminars in each participating region. 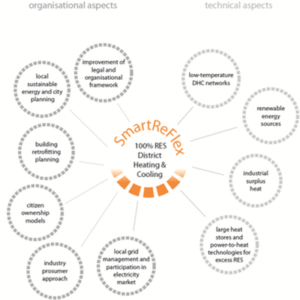 The SmartReFlex project aims at increasing the diffusion of smart and flexible district heating and cooling (DHC) grids and systems, basing on high shares of renewable energy sources (RES), in European cities.